Port-wine stains (nevus flammeus) are malformations of tiny blood vessels that connect the veins to the arteries (capillaries) located in the upper levels of the skin. These irregularly shaped patches range in color from light pink to red to dark red-violet and may darken with age. Port-wine stains, usually located on the neck, face, and scalp, occur in about 0.5% of newborns. More than one-third of infants are born with a pink patch at the nape of the neck or on the eyelids (called an “angel’s kiss,” “salmon patch,” or “stork bite”). These are minor blood vessel dilations and are not true port-wine stains. Those located on the eyelids and forehead fade slowly and eventually disappear. Those at the base of the neck are often permanent. For help with getting rid of port wine stains, contact Dr. Rokhsar to schedule an appointment. The lesions are congenital, but the cause is unknown. Port-wine stains are present at birth and vary in size and shape. They first appear pale pink in color and darken with time. The texture can change gradually from smooth to thickened and pebbled. Port-wine stains are diagnosed mainly by their appearance. Infants with a port-wine stain that involves the upper and lower eyelids usually undergo a magnetic resonance imaging (MRI) scan or other types of brain scan. This can help the physician diagnose or exclude Sturge-Weber syndrome. Approximately 5% of infants with a port-wine stain on the eyelids are at risk for this condition, in which the lesion involves the trigeminal nerve, the eye, the meninges (thin membranes surrounding the brain), and the brain. Seizures occur in about 80% of those afflicted. Glaucoma, developmental delays, and partial paralysis are other aspects of Sturge-Weber syndrome. 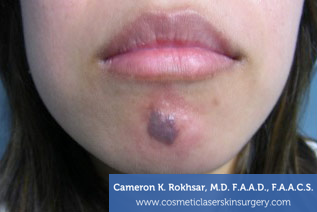 Pulsed-dye laser treatments offer safe and effective treatment for port-wine stains. Treatment success depends on the age at which it is begun and the location of the lesion. With multiple treatments, most port-wine stains can be significantly lightened. Topical, local, or general anesthesia can be administered before the procedure to minimize discomfort.